Hurrah! A John Carter Role Playing Game! If this hasn’t been a sf / fantasy setting aching to have an RPG based on it, I don’t know what is. 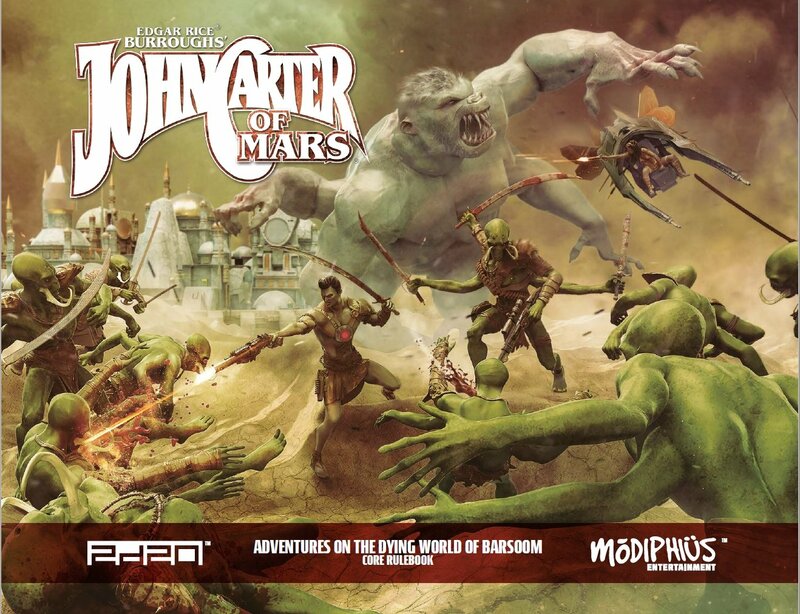 John Carter first appeared in a serialised adventure called ‘Under the Moons of Mars’ by Edgar Rice Burroughs in All-Story magazine in 1912 and was then published as a novel under the title of Princess of Mars in 1917. Burroughs was to produce a series of novels featuring this hero and his adventures on Barsoom (Mars), and also novels featuring Carter’s descendants and other Barsoomian characters, the last being John Carter of Mars, which was published posthumously in 1964. Carter was to later appear in comic strip adaptations by Dell Comics, Marvel and Dynamite Entertainment. His most recent appearance has been in the rather splendid 2012 film John Carter starring Taylor Kitsch, Lynn Collins, Ciarán Hinds, James Purefoy and Willem Dafoe (well, I liked it even if no body else did, so there). Barsoom is as rich and original as any fantasy world with exotic flora and fauna, where swashbuckling adventures take heroes in voyages on flying ships to ancient temples and into conflict with bizarre monsters such as six-armed green warriors, synthetic men and have them sucked into the Machiavellian schemes of Zodanga (boo-hiss!). Modipius have done a great job of bringing this game to life and doing so in a manner that is very playable as an RPG. The material production values of the rule book are of the company’s usual high standard. The book – rather unusually – is produced in landscape format in order to add drama to the epic illustrations of the Barsoomian landscape. One downside is that while the artwork is generally rather good some illustrations are a little disappointing, sometimes verging on the amateurish. But the game itself is rather splendid and utilises Modiphius’ house gaming mechanic: the 2d20 system. I’ve banged on about 2d20 system before in my reviews of other Modiphius games on this site, so won’t repeat myself here, other than to say that not only does it work well as a game engine, but it has this mysterious quality that enables a GM to evoke the specific flavour of a game world; whether that be Conan’s Hyboria, or Star Trek’s Federation. This system plays its part in bringing Barsoom to life in a game setting. The system works very well to facilitate games that encompass swash buckling action, treachery, intrigue and romance. I will also flag up a problem with Modiphius game books that I have highlighted before: the company still have a problem with their writing. In crucial sections of the rules dealing with more complex points, the writing becomes obfuscating, unclear, confusing and vague. I know I’ve gone on about this when reviewing Conan and Star Trek games- but it is a point that Modiphius need to address. I was beginning to think it was just me fixating on this kind of stuff – but I’ve spoken to many people who have said the same thing. So Modiphius, your games are great, especially this one, but PLEASE sort this on-going nagging problem out. The John Carter RPG has already got a lot of support material available. Not least a rather lovely line of miniatures that look rather smashing and evoke a true Barsoomian feel and style. There’s a GM screen which includes all the stuff you need and expect as a GM and, a Narrator’s Toolkit. (yes, we have to call GMs narrators in this game, not as crap as ‘Keeper’ I’ll admit). On an initial skim through the GM .. erm, Narrator’s Toolkit I thought that this was a bit of a nice to have but superfluous product, however as I explored the game more I changed my mind. John Carter is a game in which the heroes run around with swords fighting monsters and baddies; as such it would be very easy to design and run games which are not that different from any other RPG which features heroes running around with swords fighting monsters and baddies. It’s here that the Toolkit comes to the rescue by giving advise on how a game can be designed and run so that it emulates a John Carter narrative in spirit and style, and how you can create NPC adversaries and allies that are truly Barsoomian rather than stock RPG characters. The Toolkit ensures that you will be playing John Carter, not Dungeons & Dragons with flying boats. Similarly, the scenario / campaign guide Phantoms of Mars provides the narrator (I remembered this time) with a par exemplar John Carter adventure to run and use as a template when designing their own games. Inveigling characters in a story which centres on a conspiracy instigated by a sinister and secretive organisation, this campaign has players skedaddling from one pulp influenced episode to another and is embedded with true Barsoomian flavour. Also, rather nicely there is a set of skirmish miniatures rules that enable you to utilise Modiphius’ John Carter miniatures which plays rather well. I am a big John Carter fan and I have been looking forward to this game for some time. Yes, I stand by my remarks about the artwork and writing being a bit shoddy at times, but the game far from disappoints. Indeed, it exceeds the rather high expectations I had of it.